Almost a year on from when Brian Craib contracted meningitis and although he's not back to full health he is making excellent progress. Brian is very happy to be back doing what he loves the most, taking choir rehearsals and conducting concerts. 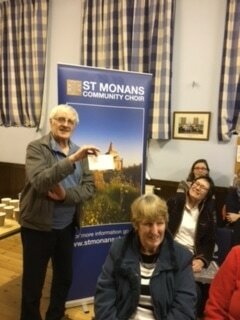 St Monans Community Choir's who Brian teaches and his wife Ruth helps out, are very grateful to have Brian back full time. They wanted to show their appreciation for the work Brian and Ruth do and so they presented them with a cheque for £150 for Meningitis Now. This is so very thoughtful of the choir, and we know that Brian and Ruth are very thankful for all their support. St Monans Community Choir was formed in October 2009, as a follow on to the inaugural St Monans Community Arts Festival. The musical directors of the choir are Ruth and Brian Craib, professional musicians and teachers, who have been resident in St Monans since 1981. Ruth and Brian believe that everyone can sing - and specifically welcome people of all different ranges of experience, from absolute beginners to confident singers. Of course, singing together is also a highly enjoyable social acitivity, and an opportunity to make new friends! We sing a wide variety of music, both accompanied and unaccompanied; from folk and traditional to contemporary popular and show music. All you need to join is a love of singing and a desire to learn new songs.